The Hobbit: An Unexpected Journey, the first of a planned trilogy of Hobbit movies, brought about Tolkien fever worldwide, and especially a renewed love for The Hobbit and Lord of the Rings. So it's no surprise to find that there are a lot of merchandise tie-ins that go with the movie series. 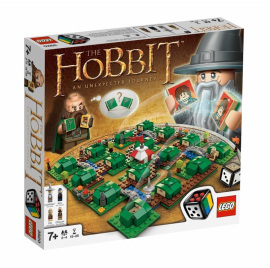 This toy is one of several Lego Hobbit play sets, but this is a fairly unique offering from Lego. 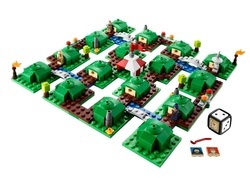 Rather than a traditional action play set, this one is actually a Lego board game. 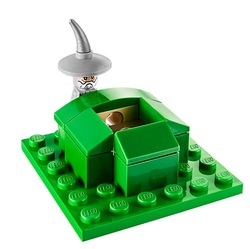 This unusual concept is sure to attract attention, and could add immensely to the play value of this Lego set. So is it actually any good, or is it just a gimmick? The first thing that you'll notice about this Lego set is that it's not a conventional play set from Lego. 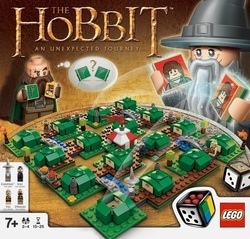 This is actually a board game made from Lego, and comes with a rule book for a special Hobbit game. It's a memory game that essentially revolves around finding the missing dwarves in Hobbiton. But there's a twist, and that's the way you can alter the game board as you play. The game itself is great fun and is offered with several slight variations in the manual. It is suitable for 2 ‚Äì 4 players and it is very easy to store away or set up, once the initial pieces have been built. Of course, it wouldn't be Lego if you didn't have to build something, so that has to be expected and is part of the fun, but it's worth bearing this in mind so you don't expect to be able to play immediately after opening the box. The figures that come with the game are a Gandalf figure, plus Kili, Fili and Dwalin the dwarves. So fans of these characters will definitely be happy with this set, though some might be disappointed to find that there's no Bilbo figure included. However, the included figures are interesting to look at and are all standard Lego models that can be played with in any other Lego set. Over all, this is definitely worth the money. It's great fun to play the game, simple to learn, and combined the creative and educational aspects of Lego with an additional memory challenge. An all-round great package.